There’s a reason this is hands down my most requested dish to bring to a pot luck. This is inspired by my dad’s recipe, which he got from the Amish lady who cooked at his center in the 80’s (though I’m fairly sure she didn’t use beer in hers). For a thicker texture, mash one can of beans a bit before combining. Dice onion, mince garlic, seed and mince serranos. Cube short ribs. Turn heat on cast iron on high, heavily salt and brown on all sides in 2 batches. Set into slow cooker/pressure cooker. Set cast iron heat to medium. Saute onions in same pan with a pinch of salt, adding in a bit of oil if pan is dry. Add in garlic and serrano, stirring as to not burn either. Cook for 1 minute. Turn heat to low. Add in tomato paste, ½ of chili powder, and 2 bay leaves. Stir constantly for 3 minutes (tomato paste can burn quickly) Add in lager, stir until sauce is formed. Add to slow/pressure cooker. Brown ground sirloin, 6-7 minutes. 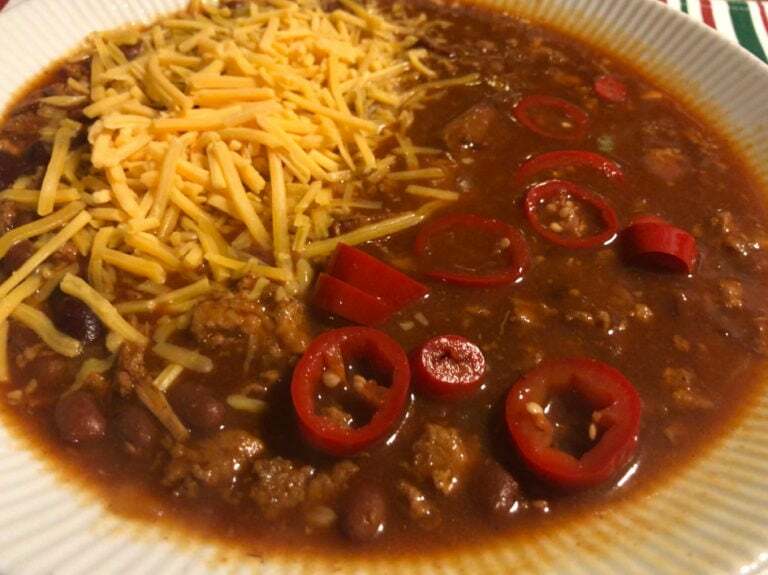 Season with 2 teaspoons salt and other ½ of the chili powder. Remove and stir in with chili, along with beef stock and beans. Slow cook for 3-4 hours on high, or until short ribs are tender. Alternatively, pressure cook for 35 minutes, or until short ribs are done. Serve topped with pickled jalapenos and cheese. *Do not substitute bone in short ribs. They are generally too fatty for this application, and while the bones do add some body and flavor, its not worth the tradeoff. Sub in chuck roast instead. ** Honestly, I use ground turkey just as much as the sirloin, if not more often. The short ribs carry the flavor, this is for body and texture. These chile powders are easily found online, and you’d be surprised what your local store might have in the ethnic aisle. Whichever you cant find, sub in (fresh!) chili powder. I usually make a double batch and put in a little extra into the chili, plus the leftover goes great on eggs, popcorn, you name it. If you use chili powder that’s been in the back of the cupboard for years, your chili will taste like sawdust. You’ve been warned. Just made this without beans for a keto friendly meal. It was delicious. Hey There. I discovered your weblog using msn. That is a really well written article. of your useful info. Thanks for the post. I’ll definitely return.